As we each grapple with how to best achieve our desired project outcomes and impacts, CADRE has pulled together some resources to help. In this special dissemination issue of the CADRE newsletter, we are excited to announce a Dissemination Toolkit, share information about upcoming DR K-12 project presentations, and more. Do you have a story about your projects' outcomes or impact to share? We hope that you will continue to leverage CADRE as a partner in your efforts to reach audiences beyond those whom you engage through your project work. DR K-12 PI Meeting: There are currently no plans for a PI meeting in 2017. Project Keyword Survey: PIs of active grants received emails on Friday (2/25) with a request to identify appropriate keywords to describe their project. Please complete the 5-minute survey for your project today! If you did not receive a survey link but are an active DR K-12 PI, email cadre@edc.org. See the live survey results. Thinking about how to best disseminate your work? This toolkit offers resources, tips, and strategies that may help. It is always good to reflect on the overall goal of your project's communication and be purposeful about how you portray and communicate your work. Visit Project Communication Plans to start planning your approach and timeline. Thank you for the enthusiastic response to our recent survey on project websites, upcoming presentations, and recent publications, and congratulations on all you have accomplished in the past year! We use this information to update project pages, the event calendar, and the resource library on cadrek12.org. 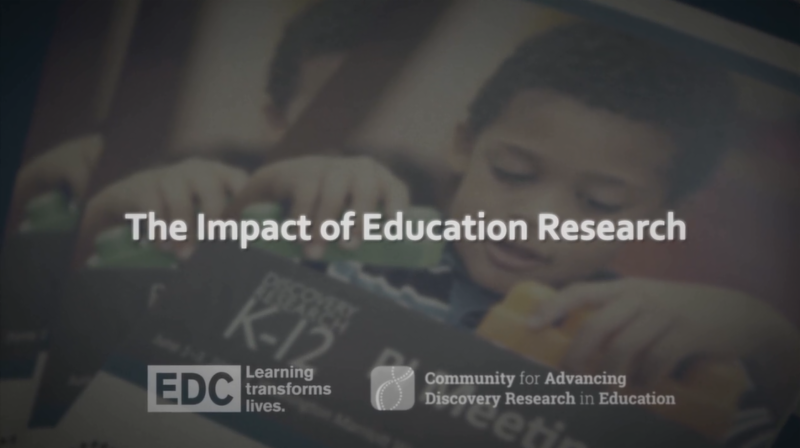 In this webinar, members of The Concord Consortium's Common Online Data Analysis Platform (CODAP) project discussed highlights from the February 15-17 DSET conference, which convened more than 100 researchers, curriculum developers, and software developers to build a community and identify innovative tools and approaches for integrating data science into the K-12 classroom. Crystal clear charts and graphs are valuable - they save an audience's mental energies and keep a reader engaged. In this virtual workshop, attendees will learn the science behind effective data presentation. We will walk through Dr. Evergreen's Four Step Visualization Process and along the way, consider how audiences will engage with our visuals, which chart type will best tell the story in the dataset, and how we can leverage easy to learn design skills to sharpen our message. The 2017 STEM for All Video Showcase will focus on "Research & Design for Impact." Registration to present in the showcase is now closed, but you can still participate! All are encouraged to view and engage with the work of your colleagues across the National Science Foundation's Education and Human Resources Directorate. Interested in being a facilitator for the Video Showcase? If so, please email cadre@edc.org by March 24th. On January 18th, CADRE hosted a virtual meeting for CAREER awardees, during which current awardees met with a former CAREER grantee to discuss tips for working with graduate students and advisors. This meeting was part of CADRE's broader efforts to support early career researchers and developers. In the spring, CADRE will host an informational webinar on the DR K-12 CAREER program and solicitation for prospective proposal writers. We're pleased to share this quarter's news from DR K-12 projects and people, as well as our sister resource networks who serve other NSF funding programs (ATE, CAISE, CIRCL, CS for All Teachers, MSPnet, and STELAR). In addition to our newsletter digest, we disseminate your news items on our website and social media. Let us hear from you! In the Press | In this Connected Science Learning article, Julie Yu and Sara Heredia describe The Exploratorium Teacher Institute (TI) and its work focused on implementing Next Generation Science Standards. Awards & Recognition | In Ask-a-Tech-Teacher's annual recognition of exceptional tech-ed resources, Scratch Jr. was awarded Best in Coding. Scratch was also mentioned as an exemplar in the Insight article How Emerging Technology in Education Enhances the Classroom. Publication | In her International Journal of Education in Mathematics article, former CADRE Fellow Jenny Dauer discusses research showing that "teaching and using a seven-step decision-making model helps students become more scientifically literate." Product | Doug Clements and Julie Sarama are the featured experts in a video-based pilot-stage professional development module on Geometric Measurement. In addition to pilot information, there are two modules currently available on the program website. In the Press | Earsketch was featured in this article after being recognized by the White House for its coding program that uses music to teach students how to code. Publication | In this Journal for Research in Mathematical Education article, Jinfa Cai and colleagues discuss "how research can have a larger impact on educational practice and what kinds of research can have the greatest impact on educational practice." Product | High Adventure Science is featured in National Geographic's collection of education resources. Science Education: From Separation to Integration (Linn, Gerard, Matuk, & McElhaney). In the Press | In this Getting Smart article, PHeT and Designing Assessments in Physical Science Across Three Dimensions are cited as examples of projects with simulations and online models/tools being used in schools. Publication | In this report, based on the work of Fostering STEM Trajectories: Bridging Early Childhood Education Research, Practice, and Policy, Douglas Clements and colleagues provide recommendations for education stakeholders to improve STEM opportunities in early childhood. What Is (or Should Be) Scientific Evidence Use in K-12 Classrooms? Publication | In this JRST article, Katherine McNeill and Leema Berland "develop design heuristics to inform the design of classroom learning environments that productively use scientific evidence for student sensemaking about the natural world." Jeremy Roschelle, Kemi Jona, and Patricia Schank describe key lessons, current issues, and project work related to remote labs as an alternative method for students to conduct science experiments and data collection. The primer also includes resources and readings for those wanting to learn more. In a guest post on the MSPnet blog, Christine Cunningham describes three approaches to breaking stereotypes and building students' affinity with engineering.including websites, publications, and project information. Last month, the CS for All Teachers blog featured a three part series by Sarah Wile on research to make computer science more accessible for students with specific learning disabilities and attention deficit disorders. In a recent blog post, CAISE's Kelsey Wright curates some compelling examples of online science communication on social media platforms. On March 28, ATE Central will host the 3rd installment of their three part series on sustainability. The March session will focus on revenue generation, while recordings of the first two webinars, focused on successful partnerships and institutional support, are available on the series webpage. We encourage you to share this newsletter with your colleagues. Many of our news items, resources, and events may be of special interest to others on your project team, e.g., early career researchers and developers, evaluators, communication specialists, etc. We welcome all as part of our DR K-12 community and invite them to subscribe to this newsletter, join us on social media, and create an account on the CADRE website. Making an Impact: A CADRE Video Blog featuring Christine Cunningham, Cory Forbes, Vikram Kapila, and Kathy Perkins. Click the image to play.